Home › Bible › The Bible proves Jesus had a God. The Bible proves Jesus had a God. So who commands the almighty ? NOBODY , GOD is his own authority. The Father is God, so it does not contradict that Jesus Christ is also God by nature/substance as the Father. the Father, the Son, and the Holy Spirit are the same-substance ( homo-ousias) – all three persons are God by nature/substance, but there is only One God. One nature/substance ذات، جوهر، ماهیت but three persons. When you call Jesus as your God, then there’re necessitations for that label/belief. One of them is that he has created you otherwise it’s pointless to believe that Jesus is your God. No? 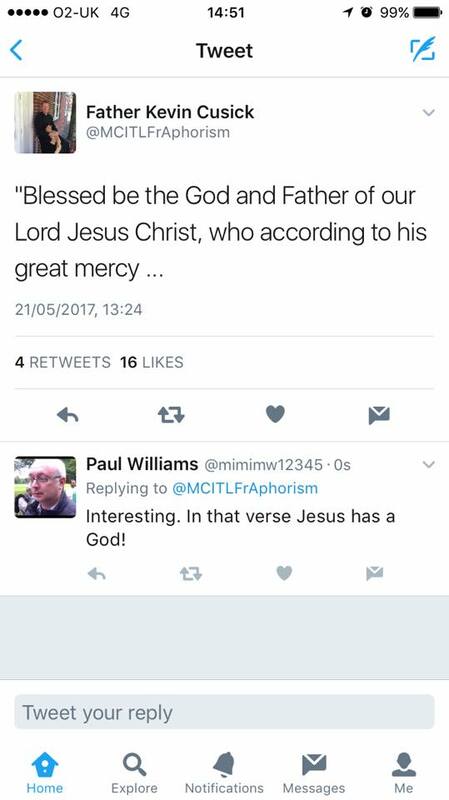 Having said that, what’s the necessitation when Jesus call the Father as ( his God) ? what makes the ghost, ghost, the father and son does not have . how can “one yhwh” have 3 DIFFERENT SELVES within it? or how is “one yhwh ” 3 different and distinct selves? WHAT makes its person different but not its nature ? Where does the Bible use philosophical terms like substance/ousia/Jawhar/dhaat etc? In the Trinity doctrine each member has a distinct self-identity. As Heathcliff mentioned below. What defines the Father as Father is not present with the Son or Spirit. What defines the Son as Son is not found in the other two. How can they be said to be one substance. Furthermore, according to the Chalcedonian understanding of the doctrine, the Son incarnated as a two-natured individual. How can the Son alone incarnate as a man if He is con substantial with the other members? Ken is happy to use pagan language from unbelievers to describe his man god. There are lots of Scripture verses that say: the Father is God, the Son is God, and the Holy Spirit is God. There are other verses that say “God is one” and there is only one God. and other verses speak of the personal relationships within the Trinity – the Father loves the Son, the Son is sent by the Father, the Spirit is grieved and testifies to the Son, etc. Putting them all together in a harmonized, non-contradictory way means that the nature of the three persons is ONE nature/substance (One God) and three persons that relate to another. John 1:1 – the third clause is key, “and Word was God” means the Word (logos, λογος, کلمه kalameh ) is God by nature, substance. But the second clause “the Word was with God” shows the two persons in communication and spiritual relationship. Ken you believe in three divine beings each of which is folly god. That is not the faith of Jesus, Moses or Muhammad. Come back to Tawheed! Yep. “Sola scriptura” under the bus when needed. An uneasy synthesis of Christianity and paganism. Are Arabic words that have entered into Farsi, because of Islam. They just don’t have the definite article in front of them, الذات = the substance, the essence; same for the other two words. (except the ending of “Maheey’at” has the “t” ت on the end; but all three words come from Arabic that communicate the basic essence or substance or nature of something. I appreciate all languages and the need to learn other languages in order to communicate accurately to people. FARSI FARSI FARSI. No one is interested Ken. they are Arabic root words. You are showing off as usual. Pride. So, when Muslims quote the Arabic of the Qur’an and say Arabic to English speaking audience, showing the source of something, that is showing off and pride? Ken you are a proud man who likes to show off knowledge of a language that no one probably understands on this blog and is not the language of the Bible or the Quran or the sunnah. You will get your reward. Omar Ibn Al Kattab, the second Khalif, and many other Khalifs after him, and generals of Islam (Amirs), who attacked Persia (Iran) and conquered them, we very interested and converted them by force into Islam and changed the language so that 40 % of Farsi today (and Turkish also) is Arabic roots. Indonesian and other languages also have lots of Arabic in them. Pride comes before a fall Ken. what does the father use to communicate with jesus? speech ? jesus ? how does it work ? is jesus speech and not person ? does father generate jesus in his voice box? please explain . but they each are DIFFERENT things doing DIFFERENT things. that you said “relate” implies they MUST be SEPARATED in order to RELATE. where does this DIFFERENCE GENERATE from? who/ what does it? if i post this claim of yours on sci.lang and they disagree with it, then will you admit you are a liar for jesus and your people are scum bags for killing cultures and languages and replacing other peoples languages with english language? also show evidence that it was not naturalized but done by force. therefore conquering is to blame? Yawn. And how is this related to your philosophical speculations about the “trinity”? Polyconfusion at its best. Poor thing. Why did Muslims write philosophical works also? (Al Ghazzali, etc.) and Sufi mystical works and poetry ? (Rumi, Hafez, Saadi, etc.) there is nothing wrong with commentaries and theological works that use philosophical language in order to communicate the meanings of deep and ancient concepts and that were written in other languages in an ancient context. So you happily mix PAGAN concepts and language into your theology? You are very inconsistent Ken. You do not really believe in sola scriptura. Sola Scriptura does not say that other words (like Trinity, homo-ousias, hupostasis/persona) cannot be used to explain the Biblical data. Luther, Zwingli, Calvin, and all recognized this. You use unbiblical words and concepts taken from pagan philosophy. You justify this by appealing to man’s wisdom not God’s. And there is not one that says God is a trinity. Or God is three persons. Or God is one divine substance. Ot there is perichoresis within the trinity. Nothing, zilch, rien, nada. None of muslim philosophy was turned into orthodox creed. Your philosophical speculation is your confession of faith. Your philosophy is your God. Pagan godless concepts literally define Ken’s holy God! the word Towid توحید is actually not in the Qur’an, so you are wrong. Boom. Where does it say “God is three”? Apart from a forgery in 1 John? Come on, don’t be shy, Mr boombastic missionary fail. Matthew 28:19; 2 Cor. 13:14 – if one can count “the Father” ( 1 ) and the Son (2) and the Holy Spirit (3), then one can see the three persons. No three persons defined anywhere. Nothing, rien. What about the other persons called “God” in the Bible? If one can count, you get more than three persons. Boomshackalacka. there is only three that are called “God” in the NT – the Father, the Son, and the Holy Spirit. Matthew 28:19 and 2 Cor. 13:14 are limited to three persons. “Matthew 28:19 and 2 Cor. 13:14 are limited to three persons.” It doesn’t say that at all. You make that stuff up. Most Christians probably understand that to be three modes. There is not one verse that says God is a trinity. Or God is three persons. Or God is one divine substance. Ot there is perichoresis within the trinity. Nothing, zilch, rien, nada. Ha. And throwing the OT under the bus when it suits you. What a lousy missionary. I never throw the OT under the bus. Psalm 82 is mocking proud and arrogant and unjust political leaders and judges who think they are “gods” (because of their worldly power), but they are not; they will die like men. The Son was on the earth and incarnated (John 1:1-5; 1:14; Philippians 2:5-8) and said, “My God, My God, why have you forsaken Me?” (quoting Psalm 22:1) and since the Father is God, there is no contradiction there. The Son voluntarily bore the wrath of God against sin for all the people from all nations for all time who would believe in Him. Why should we look up all these verses? You should quote them. I bet no one ever reads your lists. I will bet you know what Mark 10:45 says and Isaiah 53, because you have dealt with those verses before. You could probably quote some of them. Mark 10:45 – the Son of Man came to serve and give His life as a ransom for many. Jesus Christ became the curse (judgement/took the punishment/ voluntarily took the wrath) for us (on the cross). Because He voluntarily, out of love, came and took the curse for us, and accepted the punishment for our sins, He cried out “My God, My God, why have you forsaken Me?” because the Father poured out His justice on Jesus on the cross who came and took the punishment for us, for people from all nations and cultures and languages. feeling abandoned as He bore the wrath is not a split in the Trinity. There is no split. Really? So when Jesus complained he was “abandoned” by God he was wrong! If only you had been around to put Jesus right. He was speaking out of His human weakness as He bore the wrath of God the Father – there is no ontological split in the nature of the Trinity. Jesus was also quoting Psalm 22 in order to point to other parts in the Psalm that were prophesies of suffering servant Messiah descendent of David. so if there was no split, how come nothing leaked into the father and ghost? how did the flesh bit give “feeling” to the spirit bit? how did the world of flesh put anything into the world of spirit ? so 1 person , 2 natures was speaking about why father POURED on him . if he was POURING on himself, then that would mean he was POURING WRATH on the trinity . We were yet sinners(5:8), ungodly (5:6), helpless(5:6), enemies of God(5:10), yet Jesus came and died for us on the cross. 11 And not only this, but we also exult in God through our Lord Jesus Christ, through whom we have now received the reconciliation. Jesus taught that repentant dinners sinners did not need mediator to be forgiven. Just turn I Allah. I agree. Then why do these two Hadith indicate that actually Muhammad is mediator/intercessor on the last day? Intercession yes. Jesus taught like Muhammad that we should pray directly to God. So you have corrupted the faith of Jesus. Come back to the narrow path Ken. Your sin separates you from God. daniel says you don’t need jesus but a contrite heart. You mean David, in Psalm 51. You refer to verse 17, but one has to take all the verses of Psalm 51.
hyssop was a tree branch used as a brush to spread the sacrificed blood; so David includes the blood atonement sacrifice in the temple (verse 7) along with true heart repentance (verse 17 and the whole Psalm). So he did not need Jesus to commit suicide for him. Thanks for proving my point Ken. Jesus taught us in the Lord’s Prayer to go directly to Allah, not Jesus or Mary. ONE STILL NEED TO SEEK GOD DIRECTLY , RIGHT? where is violent opening of jesus found here? when the jews were seeking god while they were in danger, did they imagine a sacrificed dying one? ken, why do you hold a bloody cross? What do you even mean? I have never “held a bloody cross”. Protestants don’t even have crucifix’s like the Roman Catholics do; we usually have an empty cross, as a symbol of Christ’s finished atonement and that He rose from the dead, never to die again, death no longer is master over Him. 10 For the death that He died, He died to sin once for all (meaning, He paid the price for our sins); but the life that He lives, He lives to God. the empty cross is a symbol of His resurrection power from the dead, and proof of the efficacy of the final sacrifice on the cross. 1. who told hebrews to look after the animal? 2. when the hebrew is slicing the neck of the animal is he obeying his god? 3. does yhwh say that OBEDIENCE IS BETTER THAN sacrifice? I don’t like blood sacrifices; God required them in the OT tabernacle and temple sacrificial system – Exodus 12, Leviticus chapters 1-7, 16-17, 1 Kings chapter 8, etc. Even the title of the 2nd chapter of the Qur’an, Al Baqarah (the Cow, or the Heifer) – even this shows that the Qur’an understood some basic level that the law of Moses commanded sacrifice. The English of the first question is not understandable. I don’t know what you are trying to ask. No. 2 is all through the OT and sacrificial system. No. 3 is about doing the ritual without heart repentance and faith. God required both 1. sacrifice and 2. true heart repentance and faith. Not understandable English. Try to formulate your questions with better English. even human sacrifices ? why not ? i will try to use british english . yhwh, your god, says that he does not like BLEMISHED animals. he likes UNBLEMISHED meat. is it a good deed to look after an animal ? yes, you don’t like what your torah told you to do. you TRASH your gods wish. So Dr. Brown is arguing for the importance and the centrality of the blood offerings described at length in the book of Leviticus. Does Dr. Brown hear what he is saying? Is he encouraging you to obey the Torah and bring the offerings that Moses commanded us to bring? When was the last time that Dr. Brown brought a goat to the Temple in Jerusalem to atone for his sins? Does he yearn to fulfill God’s commandments concerning the sacrifices as do the Jewish people? Of course not! He doesn’t care about the animal sacrifices that are described in the Torah. But it gets even worse. Does he really believe God when He says that the animal sacrifices brought in the Temple have the power to atone? Or does he believe that Book of Hebrews which declares that the animal sacrifices never atoned to begin with (Hebrews 10:4)? Dr. Brown believes that the sacrifices described at length in Leviticus never really atoned for sin at all and that once Jesus came on the scene, they were discarded and done away with. Is this “acknowledging the centrality of the offerings”? I am sorry, this is just a mockery of God’s word. there you go again like all christians splitting the person into parts. so where did fully god go then ? No doctrinal Christian believes there was an ontological split in the Trinity. You are making that up out of thin air. If you use your brain rather than blinding following doctrine you will see the point Ken: God split! I could say the same thing about the lack of using your brain in denying that Jesus was crucified and dead in history and that the Qur’an did not know what the doctrine of the Trinity is; nor did the author of the Qur’an know what Christians meant by “Son of God”. who poured on jesus ? trinity or just the father ? if just the father , then what did the father have to pour on jesus ? is the son saying that a shared nature has forsaken him ? if jesus = 1 person, 2 natures, then he speaks through both natures. so did jesus say a shared nature forsook him? a person MINUS shared nature forsook him? What’s the necessitation when Jesus calls the Father as ( his God)? You are using that word “necessary”, when the text just says that what Jesus said. The text does not say “it was necessary for Jesus to cry “My God”, rather He just did, because He was quoting Psalm 22. Since the Father is God also, it is not a contradiction; obviously. why do you demand that you frame the issue as “necessary”? it is there, “My God, My God . . . ” it doesn’t say “necessary”. 2. He is expressing the feelings of being forsaken as He bore the wrath of God against sin. (Galatians 3:10-13; Isaiah 53:6; Isaiah 53:10) But He was not abandoned, even though it seemed like it, because He was bearing the penalty and wrath of God against sin; He was bearing God the Father’s justice against sin. verses 19 to the end of Psalm 22 shows that God vindicated the Son Jesus; and there is no abandonment or “split” in the Trinity. Feelings of abandonment is not actual abandonment; and bearing the wrath of God was very heavy and serious and He really experienced and felt that. When you call someone/believe in someone as (your God), you imply something by that ( i.e there’re necessary consequences of that belief theologically). For example, when you call Jesus (my God), that means, rather it has to mean that Jesus has created you in your heart & mind, doesn’t it ? Based on that, I’m asking about when Jesus himself calls the Father as (his God), what does that have to mean/imply? A reminder for mr. Ken. why did the Jews think that 1 person, 2 natures was calling out to eliyah? Those Jews were so dumb that they didn’t know psalm 22? why did it take 40 years for mark to make link to psalm ? How did mark know what Jesus was saying on the cross when crowds of screams would have put out jesus voice considering that prior he got a whooping by the pagans? To tell readers that your god was “feeling” abandoned would imply a problem. when people will be punished by god, do they have any divine support? When Noah’s people were drowning, did they receive divine support at the same time? if your pagan god was FEELING abandoned, then JUSTICE has not been done, your god bUilt himself “to take” his own wrath I.e he was EATING his “Popeye spinach” as he was punishing himself, this would mean it could not MAKE IT a real and TRUE suffering in the SENSE people in hell will SUFFER. so the ppl in hell get it more than jesus on the cross. since god saved himself from eternal damnation and built himself to take his punishment, then your god CHEATED. If the father did not really experience and the ghost did not experience, you already created a separation in who was really experiencing what. You are saying on one hand tha t the person is REALLY losing his eye and on the other hand , he just HAS the feeling of loss of eye, but the eye is still there. So which is it? Separated eye or not?